An ex-monk, Drakil Tanan, has transformed himself into the ultimate harbinger of death by stealing the magic from the most powerful dragon of all time, the Dragon Lord. With this newly found power, Draak (as he now calls himself), the disciple of necromancy, is determined to cast the land of Uma back into the days when chaos and evil reigned unbridled in the realm. 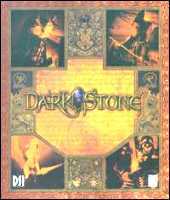 In Darkstone, you are the chosen one to counter Draak's plan to plunge the world into a new Age of Darkness. Character choices are made from four classes (wizard/sorceress, assassin/thief, warrior/amazon or monk/priestess). The overall objective is to track down the seven crystals of the Time Orb, created a millennium ago from the tears of the benevolent goddess Kaliba and restore it. Only then will you have the power of the mighty Orb at your disposal to use as the ultimate weapon against Draak. Darkstone requires a 3D acceleration card and offers both single player and multi-player (up to four players over a LAN or the Internet) modes. During character creation, an option is provided to generate either one or two characters from the aforementioned four classes (each class contains a male and female character). If dual characters are generated, you choose which to guide, while the computer takes control of the second. At any time during the adventure, you can toggle hands-on control between the two characters and give specific orders to your computer-controlled companion. By the numbers, Darkstone contains four distinct regions of Uma, more than 100 evil creatures based on 30 types of characters, 32 specific spells and nearly two dozen skills (six major). Additional features include full 360-degree movement, more than 30 weapons (some multi-purposed), numerous items and traps and over 200 enemies and characters with which to interact.